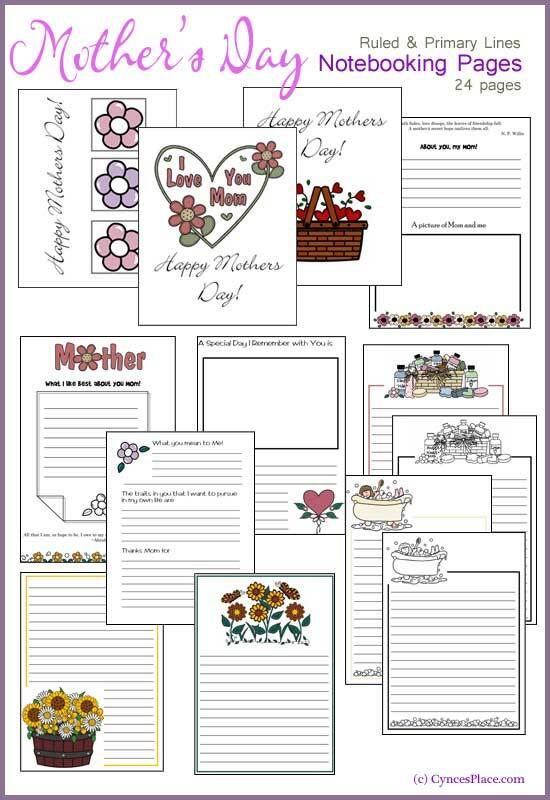 Mother's Day notebooking pages: A cute set of Mother's Day notebooking pages that can also be a keepsake. I found them! This set of Mother's Day Notebooking pages I made about 5 years ago. The files are a little bit large, I didn't know how to scale down graphics back then. 🙂 I don't have the original file to edit them. So, they might take a while to load and they will have my old web address. But, they are still great to use for Mother's Day. My Mother's Day Lapbook Find my Mother's Day lapbook and coupons on this page. The History of Mother's Day - this is an article written in 1913. Right now this Mother's Memories lapbook is only $4.50. This lapbook is for Mom! What a great idea! You create it as a keepsake for your kids, full of YOUR memories. How neat is that. And, I know your kids will love it.